RECENTLY the press reported the case of a wealthy man who died from the direct use of radium, in a way that made it necessary for the authorities to step in and investigate the so-called “radium cures”. The victim, Eben M. Byers, an iron manufacturer, died in a New York hospital from the effects of radium absorbed by drinking “radithor”, a radioactive water manufactured by the Bailey Radium Laboratories, East Orange, New Jersey. In this case, the radium-charged water was put up in small bottles; and it has been ascertained that Mr. Byers drank a number of bottles a day for a long time. Eventually, the active radium settled in his bones, where it set up necrosis (death of the tissues) and, in due time, the patient died; there being no known antidote once radium has been absorbed by the bones. Similar cases were reported several years ago, of a number of workers poisoned by radium-impregnated paint in a factory where luminous watch dials were made. In this case the workers had a habit of moistening the fine paint brushes with their tongues, thus carrying into the system active radium; and practically all of the workers who had thus absorbed radium died in a similar manner, that is by disintegration of the bones. There has been so much erroneous and misleading information printed in the newspapers, and elsewhere, about radium that it becomes necessary to enlighten the public at large with the true facts of radium. This article is intended to do so, by giving actual scientific information on the subject as it is know today. Since a popular article should be understood by everybody, I have tried to keep out of this all technicalities that would confuse the layman, and give only such information as anyone can readily understand. Radium is an element, like gold or silver, sulphur or oxygen; except that it has certain marvelous properties which are peculiar to radioactive elements alone. Radium is an unstable element and one of the few we know that changes gradually into another element over a period of time. The scientist calls this atomic disintegration. Radium, as an element, disintegrates and finally turns into the common element, lead. In this it approaches the dream of the alchemist, but in the reverse order: that is, an extremely valuable ele- ment (radium) changes into an extremely cheap element (lead), but it does not do so quickly. A long time must elapse before the change is half completed. It takes around two thousand years for half of any given quantity of radium to change into lead. While it is doing so, a number of remarkable things are constantly happening in and around the radium, all the time, for the entire two thousand years. In the first place, the radium is breaking down, successively, into a number of different substances; all of which continue disintegrating until finally, the whole of the radioactive substance will have disappeared, and only inert lead is left. We make a comparison with a log of wood burning, and sending out light, heat, and products of combustion. The wood becomes dry, then turns to charcoal; and the charcoal burns, leaving only ashes; while smoke, steam and vapor rise. However, in the case of the radium, the several stages are represented by substances which appear to be true chemical elements; the leaden “ash” is nearly the whole weight of the radium; and the energy liberated is enormous. During the series of changes, radium and its disintegration products are continually giving out rays, so-called, and distinguished as Alpha, Beta and Gamma rays. These are not alike, however. The Alpha rays the “smoke” of our radium” appears to be identical with ionized helium gas, composed of positive electrified particles, shot out from the radium atoms with terrific force at a speed of about ten thousand miles a second, though they do not go far. The Alpha rays, striking upon matter which they cause to glow brightly, cause the luminosity of radium paint. The Beta ray is a discharge of negative electric particles or electrons, like those in an ordinary radio vacuum tube, or a cathode-ray tube. They have, however, a much higher velocity, nearly the speed of light; 180,000 miles a second. The Gamma ray is a true ray, and similar to X-rays from a very high-power tube. The Gamma ray travels at the full speed of light, and penetrates through metal walls and other objects which stop the Alpha and Beta rays. The smallest quantity of radium we can detect contains millions of atoms, in different stages of change; so that its presence is always accompanied by the generation of these three rays, all at once. We might compare this to a ball of soap produced by the mixture of three separate pieces, scented with rose, violet and musk, respectively. The ball would continue to give off all these scents, combined, as radium gives off together the different rays caused by its internal commotions. However, while the emanations of perfume may in a way be compared to those of radium, the activity of the latter is equally continuously, but unimaginably more powerful. When I say powerful, I do so purposely. As a matter of fact, the power contained in the element radium is so tremendous that we can hardly form a good picture of it. I have attempted to show pictorially the tremendous and titanic power locked up in the radium atom. If it were possible for us to extract from radium within a few seconds all its inherent power, we would be able, with a minute quantity of radium – ”only as large as a pinhead – ”to lift the Empire State Building bodily into the air, as shown in the illustration. We can-not do so at the present time, because we are powerless to influence the rate at which energy is given out by radium, and we have to sit by and wait for thousands of years before it is all expended. Once we understand how to unlock or speed up the energy within the radium atom, we will be able to drive the biggest steamships across the ocean, a number of times, with a few grains of radium as the total motive power. Now, coming to things nearer home, let us discuss the effects of radium on the human body. It was found early by physicists, working in conjunction with doctors, that X-rays could be used beneficially in certain types of cancer. Cancer is a disease wherein body cells which are normally controlled by some internal secretion, become out of control, and grow so rapidly that they draw upon the rest of the body until sooner or later, unless the growth is checked, the patient dies. There are a number of different types of cancer; but even today, medical science knows very little about it and is still largely in the dark as to its cause and as to its treatment. One thing is recognized and that is: Certain types of cancer yield to X-rasys and to the Gamma rays of radium, which are one and the same thing. If discovered in time, such cancerous tissue, when radiated properly with powerful X-rays or Radium Gamma rays, will actually be destroyed and the mischief stopped. On other types of cancer the Radium rays and X-rays have no effect whatsoever. Specialists particularly call attention to the fact that the regular medical practitioner is inexperienced in cancer treatment; and for that reason experts in cancer treatment, who really are physicists, should always be consulted. When radium first was discovered, and for a number of years after its discovery, numerous quack manufacturers jumped up all over the world to prey on the public credulity, and they advertised all sorts of infamous “cures” in which radium in some form was used. In this way we had “radium-charged waters,” “radium pads,” etc., that were supposed to help anything from falling hair to ingrown toe-nails. “Radium salves” and many other high-sounding but fraudulent radium preparations and contraptions which cost the public a lot of money but were, of course, totally ineffective, were put on the market. 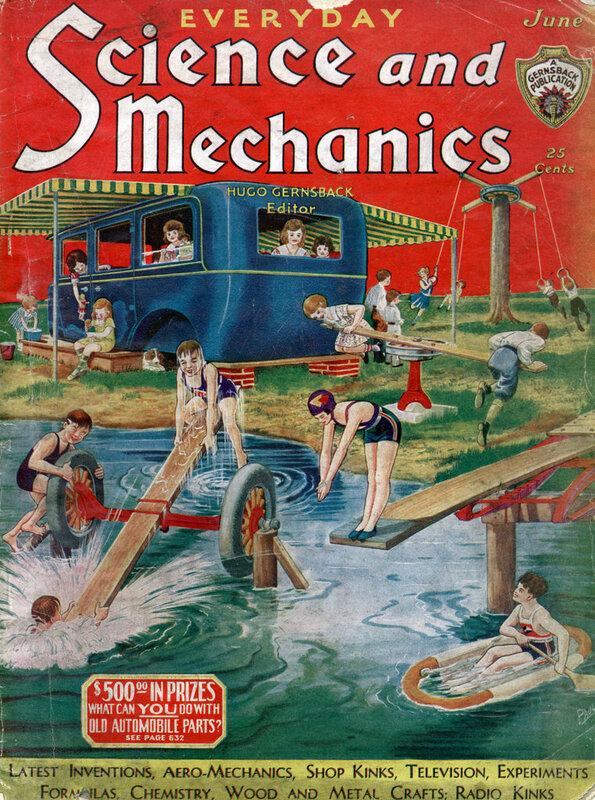 No doubt, the most dangerous vehicle of all is the so-called “radium-charged” water. But let me point out first that, ever since you were born, you have been drinking radium-charged water. Radium is so active and there is, believe it or not, more radium in nature than you think. You cannot fill a glass from your tap without having radium-charged water. You cannot breathe air without its being radium-charged. The point is, however, that the amount of radium which you can thus absorb in your system by either drinking or breathing it, is so infinitesimal that it takes the most sensitive instruments at the disposal of science to even detect its presence. If the radium manufacturers who sell radium-charged waters were selling you ordinary tap water instead, not much harm would be done. The trouble is, that they actually go to the trouble of charging the water with a minute quantity of radium; and the water thus becomes fairly radioactive. If you drank only one glass of such charged water once a month, perhaps no harm would come of it; but if you drink several glasses or bottles a day, it produces what is called a cumulative effect, which becomes great enough, in time, to affect your bones and there will be no further cure for you. For all practical purposes, therefore, keep away from radium-charged waters. While, as a rule, they are only weakly charged, yet someone might make a mistake and charge the water too heavily, and mischief might arise. There is in fact, as authorities point out, no greater danger from radium than in taking it internally. Then, we have a host of “radium pads”, one of which is illustrated in these pages. It is usually a piece of fabric, or the like, impregnated with active radium salts. Usually the quantity is exceedingly small, and a pad measuring six inches by three is not more active than if you had a dozen radium watch dials. As a matter of fact, many of the pads and appliances are not as active as a good radium watch dial. “Anemia, Arteriosclerosis, Arthritis, Asthenia, Diabetes, Epilepsy, General Debility, Gastric Neurosis, Heart Disease, High Blood Pressure, Hy-perthyroid, Hysteria, Infection, Kidney Troubles, Muscular Atrophy, Neuralgia, Neurasthenia, Neuritis, Obesity, Prostatitis, Rheumatism, Senility, Sexual Decline, Virility.” This is an actual list taken from one of the manufacturers* numerous booklets on the subject. You can do all of this much cheaper by buying a dollar watch with a radium dial and applying it to any one part of the body affected. It will do you just as much good, with one exception – ” that is the wearing of the watch may prove wearisome and cause an abrasion of the skin – ”but as to curative effects, it is nil. “It is the overwhelming consensus of opinion of the authorities consulted that radio-active waters have no therapeutic value whatsoever. Radioactive waters have been used with alleged slight benefit by certain members of the profession for some conditions, such as arthritis, they tell us; but although this matter has been thoroughly tested, definite evidence to support this view is lacking. A possible explanation offered is that the slight benefits sometimes claimed are due to the consumption of a large quantity of water, rather than to any specific properties of the water. This is a water jar manufactured by the Radium Ore Revigator Company, a Delaware Corporation. The crock was somewhat porous and had imbedded in its walls some radio-active material. Drinking water is poured into the crock and it delivers, actually, weakly-radioactive charged water. 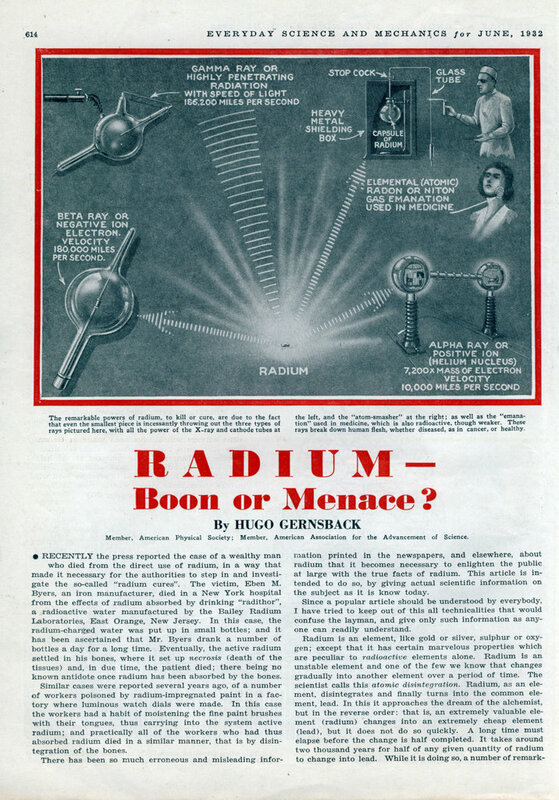 In summing up, therefore, it should be noted that the public should never, without proper advice of an accredited radium specialist connected with a hospital, use any radium appliance of any kind. It will either, as in the case of charged waters, be extremely dangerous; or, in the case of radium packs, bandages and the like, be totally ineffective and a waste of money. First we have a flower grown normally. Second, one grown under some form of radium emanation. The first plant will be normal; the second, radium-charged plant will show luxurious growth. Sometimes a third plant is shown, dead or withered; here the effect of “too much radium” is then made “clear”. The manufacturer of the appliance will point to the middle plant and call attention to the fact that his device has all the beneficial properties. The reasoning is faulty; because, in the first place, if you have arthritis in your arm, you certainly do not wish to make your arm grow 50% longer; or if you have a case of baldness, it will not do you one bit of good if your head is enlarged or grows some 50% higher. The argument, of course, is quite foolish. In the first place, the human being is not a plant; and while a plant might perhaps absorb radium salts and not die from this because it cannot possibly contract necrosis of the bones; human beings and animals may. Consequently, what may be good for a plant may be death for man, and vice versa. Do not be misled by foolish claims and analogies of this type, as they mean absolutely nothing. In order to present to our readers the best medical knowledge prevalent, at the present stage of research in this country, the writer took the pains to send a questionnaire to the foremost radium experts in the country. In many cases, these experts are also cancer authorities, coming in contact with cases at all times. Their verdict is unanimous in practically all details. 1 – ”Do you consider the introduction of radium through radium-charged waters harmful or beneficial in the human body? 2 – ”In your opinion, is radium beneficial, or not. in connection with cancer treatment? 3 – ”Do you make any distinction between radium taken internally through medication as, for instance, charged waters, and radium introduced by the form of needle treatment such as in cancer? Are the effects the same in all cases? 1 – “Few so-called radium-charged waters and appliances for same are actually efficient. Waters containing radium or other radio-active substances in sufficient quantities to affect the body would be beneficial in very few conditions and always dangerous unless their effect upon the user is carefully watched and checked by a competent physician. 2 – “Adequate quantities of radium employed by a physician thoroughly skilled in its use, have proven of unquestionable value in the treatment of certain types of cancer. Its value is well recognized by the medical profession. 3 – “Radium taken internally is not used, and would have no effect upon cancer; and in any appreciable quantity over a prolonged period would be dangerous to the health of the individual. Radium salts and radium emanation, with the proper appliances for their local application, constitute a well-recognized and valuable procedure in the treatment of cancer. 1 – “Any water carrying a radium salt in solution is dangerous to life. 2 – “Radium is the one outstanding agent of proved efficacy in the treatment of cancer. 3 – “Refer to answer to Question 1. No educated and qualified physician would, to my knowledge, prescribe charged waters radioactive from any source. The use of radium needles is a scientific procedure. These contain radium, not in solution, but in gaseous or elemental form. The effects are definite and demonstrable, and the use of these needles is perfectly safe in the hands of physicians trained for this work. 1 – “If radium salts are dissolved in the water they are harmful. If emanations alone are present, there are no scientifically controlled experiments to prove the beneficial effect. I doubt if there is enough present to do harm. 2 – “Yes, in the hands of qualified doctors – ”not the average medical man. He should understand and have a training in physics. 3 – “Radium in solution taken internally is dangerous, and should be given only in more or less hopeless cases. Radium in needles gives the same effect as external treatment. Radium in solution may remain indefinitely and the tissues are exposed to all three rays. In needles the radium can be removed at any time, and the tissues are exposed only to the action of Gamma rays. DR. FRANK E. SIMPSON, Chicago, 111., author of numerous books on Radium, Radium Therapy, Radium and Cancer, etc. ; former President American Radium Society. 1 – “Harmful except in very minute doses for short periods of time. On account of possible danger, it should never be taken internally except under a physician’s supervision. 2 – “Yes, radium is the most helpful agent introducer for cancer treatment in this century. 3 – “The two methods are essentially different. When radium is administered in charged waters, it is taken up by the tissues and affects the whole organism. When it is inserted into cancer the effects are simply local; i.e., limited to the area treated. 2 – “Radium treatment of cancer is always external. If introduced into deep tissues, it is enclosed in a tube; the radium therefore does not enter the circulation. With radium waters the radium or its emanation (radon) actually enters the circulation. 3 – “See answer above. 1 – “Direct introduction of crude radium by radium salts into the body is harmful, because radium itself carries on a persistent destructive action against human tissues. 2 – “Radium is of distinct benefit in the treatment of cancer, but it must be applied properly by one who has had sufficient clinical training in its use. 3 – “We have never used radium in the form of radium water, nor do we inject radium. We have always used it in the form of tubules, needles, or tubes, charged either with radium salt or radium emanation – ”radon. Only the rays given off by radium are used in therapy work; these rays reach the tissues filtered through various materials. 1 – “Very harmful unless dosage is as minute as in natural mineral waters. Useless under all circumstances. 2 – “Beneficial in appropriate cases in the highest degree. In many cases, the only proper treatment if available. 3 – “All the difference in the world. In the former useless or highly dangerous; in the latter the action is local purely and hurts or helps according to the efficiency directing its use. I heard about the guy who overdosed on radium. I had also heard that he was hoping for Viagra(tm)-like effects, which is why he used so much. Wasn’t there also some guy who thought Radium had only beneficial effects, used it to grow tomatoes which he fed to his family, killing all of them and himself? Also… the Radium watch painters… one of them survived several years. Also… a famous movie had Claudette Cobert (I think) as a dying woman…. who wasn’t actually dying… pretending to be one of the watch painters. I was one of the kids that had radiation used up the nose for deafness. Back in 1946, along with the deaf and blind kids expermented on with radition. Is there more information I can get on this experment? Sorry William, all the information I have is what you see in the article.